India's main opposition party has dismissed claims that its government in the state of Gujarat supported violence against Muslims in 2002. The allegations against the Hindu nationalist Bharatiya Janata Party (BJP) were made in secret video recordings by the Tehelka magazine. They have also been broadcast on local television. The BJP has described the allegations as a conspiracy hatched by India's governing Congress party. Elections are due in Gujarat next month. 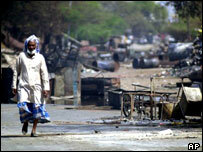 According to official figures, more than 1,000 people, mostly Muslims, died in the 2002 riots. Independent groups placed the figure closer to 2,000. A spokesman for the BJP, Prakash Javdekar, described the Tehelka report as an election stunt stage-managed by Congress. He said it was a sting operation based on rumours and hearsay. In the secret video footage, apparently filmed over six months, several hardline Hindu politicians, mostly belonging to the BJP, are seen describing how they carried out the violence against the Muslim community, often with graphic details. The Congress party has asked for all those shown in the videos to be charged with murder. 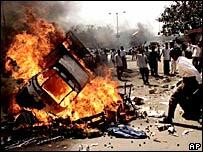 The Gujarat riots had been sparked by the death of 59 Hindus after a Muslim mob allegedly attacked a train on which they were travelling. India's Supreme Court and rights activists have accused the BJP state authorities of failing to prevent the riots, the worst religious violence since India's partition in 1947. More than a dozen people have been convicted over the violence, but many others have yet to be brought to justice. How Mahatma Gandhi's adopted home became a religious flashpoint.